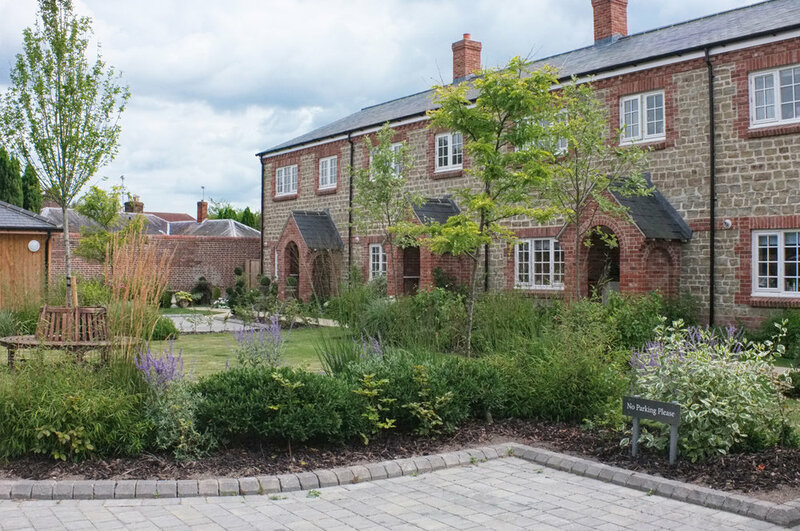 Situated near to Petworth town centre, the residential development of Courtlea contains nine cottages, constructed from local materials, with a combination of brick and natural stone. The properties are of a traditional style, and reflect the adjacent listed buildings. Enclosed within a boundary brick wall, and two cottages to the northern edge, a vehicular access route leads into a semi-circular courtyard parking area consisting of blockwork paving. The cottages are fronted with a lawn and specimen planting areas, and a communal garden of native tree and flowering shrubs. Existing willow to the Southern edge of the development has been retained in accordance with tree retention and protection measures, and the addition of accent and climber planting with flowering shrubs adds visual amenity to the site, as well as potential habitat for insects and birds. Thank you for contacting Lizard Landscape Design and Ecology!